How To Select A Golf Ball That Is Durable And Inexpensive? The best golf balls for beginners and seniors give you just that crucial little tweak that your practice might have missed. We ask a lot out of the best golf balls for beginners and seniors. Not only can the beginners benefit from this ball, they can transition to better players without changing their golf ball. What is compression golf ball ? If you look at the packaging of the golf balls, you might find the compression marking. This factor lies between 0 and 200. Compression tells you how much the ball will deflect when hit. Golf balls with lower compression are softer. Their compression flings the ball through a higher distance. These are known as ‘distance balls’. These are balls to be used by learners and high-handicap people. Check out what your average swing speed is. The pros and low-handicap players average 95 mph or more. Others can manage only 70-85 mph. Low-compression golf balls allow the latter to attain similar distances as the pros. High compression balls: Higher compression balls are meant for more control over the ball. This control is given by more spin. These require high swing speeds to lunge as far as the distance balls. These are usually called ‘tour balls’. And since good golfers use these, they know how to make use of the spin to control the ball. The high-compression balls are easier to handle near the greens. Greens approach shots require ball rolling and strategy. These balls provide that kind of finesse to your shots. The low-compression far-flying balls are rated between 70 and 80. The higher-compression balls are usually rated 90-110. What Differentiates The Golf Balls For Beginners And Seniors? We work on the premise that beginner and senior golfers have low swing speeds and high handicaps. There are two types of golf balls based on the covers on the balls. Each has different ball movement. The Surlyn balls are firmer and far more durable than the urethane balls. And they are also cheaper. Again, these have a lower backspin and offer less control than the urethane balls. But at the beginner stage, we think you will do better with Surlyn balls because they fly straighter and lower. The golf balls vary in their behavior based on the number of layers they have. They could be one-piece, two-piece, three-piece and multi-layer balls. The two-piece balls are best option for the budding or senior golfers. These are cheap and sturdy. So you can even buy used two-piece balls and not be disappointed. These usually have low to medium spin and they cover long distances with slower swing speeds. The three-piece balls have higher spin rates. They offer more control but lower shot distances. One-piece golf balls are the cheapest but they are just one god of Surlyn. As a result they don’t fly very far. These are usually used on driving ranges not golf courses. Dimples also alter the performance of golf balls. Dimples reduce the actual area of the cover. Why are the dimples important? The more area the cover has, the more air pressure affects it. And consequently smoother balls end up flying shorter. Dimples increase the distance of the shot by creating turbulence in the air they travel through. Also, as the dimples get deeper and smaller, the backspin increases. The wider and shallower dimples provide low spin rate and longer shot distances. So we would go for golf balls with more wide and shallow dimples for beginners and seniors. As explained before, low compression balls favor longer distances and straighter drive for the high-handicap golfers. Which Are The Best Golf Balls For Beginners And Seniors? We picked out those golf balls which are primed for excellent performance even by high-handicap golfers. They cover more distance with slower swings. The beginner golfers can practise better swing with these balls and boost their confidence. The senior players will enjoy the game even with limited effort. The best golf balls for beginners and seniors should be cheap because they might go through more balls per round. Of course, if you have the capital to buy better balls, you can invest in those. However, if you are still getting your swing right, the cheapest ball is the smartest option. - What Golf Ball Should I Use? - How To Select A Golf Ball That Is Durable And Inexpensive? Titleist has a piece in every pie that has anything to do with golf. So we are confident that they know their golf balls. The Titleist Pro V1x golf balls for beginners and seniors come as a set of dozen at a budget price. These golf balls are meant for all types of golfers. The Pro V1x especially is very forgiving on the high-handicap golfers compared to the Pro V1. Both these models of golf balls do well for the high-skilled players too. Though Pro V1 has a softer feel with the putter. The Pro V1X balls have a softer ZG core compared to the Pro V1s. Their urethane cover has 352 tetrahedral dimples which are optimized for moderately low spin and more distance. The Pro V1x just responds to your shot better and has slightly lower ball flight off the tee compared to Pro V1​. - Titleist Pro V1 And Pro V1x: What Is The Real Difference? The Callaway Golf Chrome soft golf balls are a pricier dozen. But boy, do they go all out on golf ball technology! Callaway claims to be the only company to have the dual SoftFast core. And it’s worth the hype. If you are a beginner, do check whether the price will fit your budget. The Chrome Soft, 2016 multilayer golf balls have two cores. The inner core has a softer compression than the original Chrome soft. The outer core is firmer and better for the fast swingers. Together, they roughly simulate the firmness of original Chrome Soft. But these low-compression balls cater to both slow and fast-swing players. At launch from the tee, it gives you fast ball speeds and low spin. This makes these golf balls excellent for the beginners and seniors. 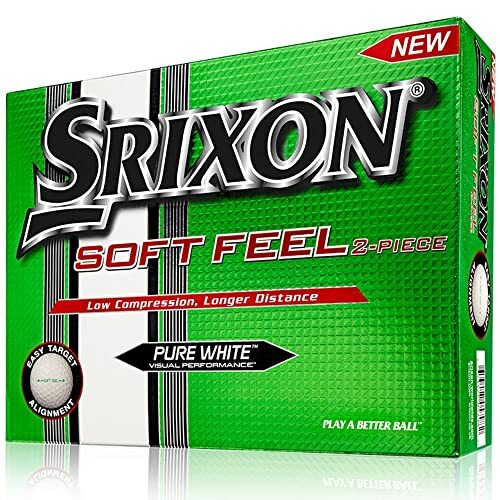 The Srixon Soft Feel are the original inexpensive golf balls intended for learners and seniors. These are the ones you can practice with and lose without burning down your wallet. They are available as a pack of 12. These are Surlyn two-piece golf balls. As we explained before, Surlyn balls are more durable and have the right feel for golfers who are just learning their ropes. They are primed to feel soft for players with low swing speeds. The surface of these golf balls has 344 dimples which is optimum for propelling air turbulence. Being pure white, they are easy spot for folks who are programmed to look for the white color. The 4-piece construction of these golf balls for high-handicap golfers is very reliable. They will not get maimed within a season or two. The urethane cover makes for tour performance and hardy construction. There is no questioning the quality of TaylorMade merchandise on a golf course. The Burner golf balls for beginners and seniors are no different. They bring quality performance at a very affordable price. These golf balls are available in either white or neon green. Both perform equally well as, we heard, is not the case with other balls. The green ones offer greater visibility when you hit them into bushes or tall grass. The white ones are for the familiar feeling on greens. The TaylorMade Burner is intended as an all-round performer. Its specs are excellent and have everything that a beginner or a senior needs to boost her or his game. These are 2-piece golf balls with 342 dimples. The ball compression is 60. All these factors are suited to help a high-handicap player improve their game. The Wilson Staff Fifty Elite golf balls are everything that a high-handicap player needs to still enjoy the game. These are named after their compression factor: Fifty. Yes, these are the rare golf balls to have such a low compression value. If you are a really bad player, this ball can transform your game. It is not as soft as you would expect from a 50 compression ball. In fact, it feels just the right amount of soft for greenside play. These are 2-piece golf balls with 342 dimples. The ball compression is 60. All these These balls are available in green, white, orange and pink colors. The colored balls are easier to spot for the elderly players when ball rolls into thickets of grass.​ These golf balls perform well by the greens. The spin rates are decent enough to get a good roll on the greens. Golf is a game of such precision that every small improvement can contribute to your play. These golf balls serve all types of players well. They are affordable and there are always good deals available online. If you are unwilling to spend that much, you can always look at the budget balls in our best golf balls for beginners and seniors list. Titleist Pro V1 And Pro V1x: What Is The Real Difference?